The rules for classical music are changing. The strict etiquette of the concert hall is making room for a more open and relaxed audience experience, as well as opportunities for more adventurous music making. Whether one approves or not is moot; the pendulum swings. This shift was evident during the Dalí Quartet’s performance, on tour with pianist Olga Kern, presented by the Carlsen Center at Johnson County Community College’s Yardley Hall. When I first heard of the Dalí Quartet, I originally anticipated a surreal experience, but here they delivered a straightforward concert. What is intriguing, along with the high quality of performance, is their commitment to mixing Latino and classical repertoire. This was our first shift in perspective: Latin American composers given comparable time and equal billing with standard 19th century European composers. 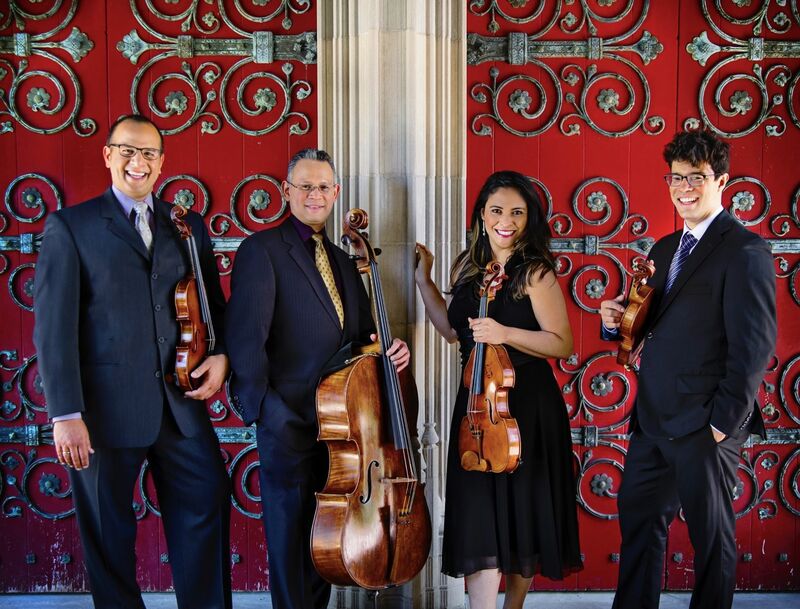 Though the ensemble operates out of Philadelphia, the musicians boast an international heritage that informs this mission: violinist Carlos Rubio and violist Adriana Linares grew up in Venezuela, and cellist Jesús Morales hales from Puerto Rico, while violinist Domenic Salerni, the newest member, grew up on the East Coast. Dalí opened the concert with a marvelous rendition of Heitor Villa-Lobos’ String Quartet No. 5, a wide-ranging work that is heroic and joy-filled. Villa-Lobos used playful slides, a fascinating array of timbres, and energies casting from frenzied to laconic, themes pulled from popular Brazilian melodies. I especially savored the way Rubio connected with his cohorts, coming in under a phase and letting it blossom; Salerni’s wild, almost operatic approach; Linares’ forthwith tone and melodic subtly; as well as Morales’ commanding air of a hard rock bassist. Between each movement, there was clapping, which seemed to bemuse the ensemble. Sure, the audience isn’t “supposed” to, but the movements end with such high spirits, it seemed an organic response, as opposed to the typical uncomfortable moment (often filled with coughing and squirming) while the ensemble resets. This was the other shift: audiences unfettered by classist expectations and responding on an impulsive, emotional level, as opposed to trained, stoic observers. There was a palpable connection between audience and musicians, even though the musicians did not directly address the audience, nor did the audience have much to go on, as far as information about the selections, with no program notes. The music appealed to the audience, the musicians conveyed that message, and the audience responded approvingly. Given that there are moments that beg for applause and moments were it is disruptively inappropriate, it’s up to the musicians to convey which is which, not necessarily for the audience to decide (especially if we think in terms of growing an audience and creating an inviting scenario that newbies want to experience again). That being said, Hugo Wolfs’ one movement “Italian Serenade” was a pleasant balm to the little bit of accumulated tension. It seemed like a summer romance, light-hearted, jovial at first, but with spurts of intensity and passion, as though something deeper could manifest from the experience. Astor Piazzolla’s “Tango Ballet” earned smiles all around. The expressions and mannerisms of the quartet breathed a liveliness into the work that too often becomes stilted by less able musicians. Again, Rubio’s sly assertions captured my attention, along with a beautiful pairing in the low voices and Salerni’s easy attention to fast passages, transporting us to a smoky dance floor in a real Scent-Of-A-Women moment. Kern, a Van Cliburn Competition gold medalist, joined the Dalí for Johannes Brahms’ Piano Quintet in f minor. That Kern is a powerhouse is without doubt, her star power emphasized by a resplendent, sparkling gown. Together, theirs was an eager, thunderous performance. Excellent communication gave the roles clarity. Brahms wrote lovingly for each voice and positioned them together in fascinating ways, the musiicans leaning into these voicings with excellent results. Brahms, that devil, certainly kept the listener engaged, with ascending lines, sudden insistent dynamic changes, and fake outs at the tops of phrases. It did seem that the piano couldn’t quite come down soft enough in a few instances, while during the louder moments the strings’ articulations were more prominent then their tone. They came to terms with the between-movement applause, and how could they not? The audience was thrilled with the show. Kern announced the encore from the stage, the only time any of the musicians directly addressed the audience. Unfortunately, she was not amplified and the details of that announcement were lost. (This is an issue all too common in performances in every venue in town, with encores, especially.) They played an arrangement of Anton Rubinstein’s Romance, as rich as lapis lazuli. This was such a strong performance that it was unfortunate that some minor awkward hesitations marred an otherwise wholly enjoyable experience. A simple nod when the audience gets excited mid-work is enough. The presenter having a microphone handy after the initial bows is helpful in making sure everyone in the audience, even to the back row, is aware of program additions and changes. The nature of the concert has changed throughout the last hundred years (and hundreds of years prior). The art form evolves, audiences shift with generations and competition for attention, and expectations shift, too. 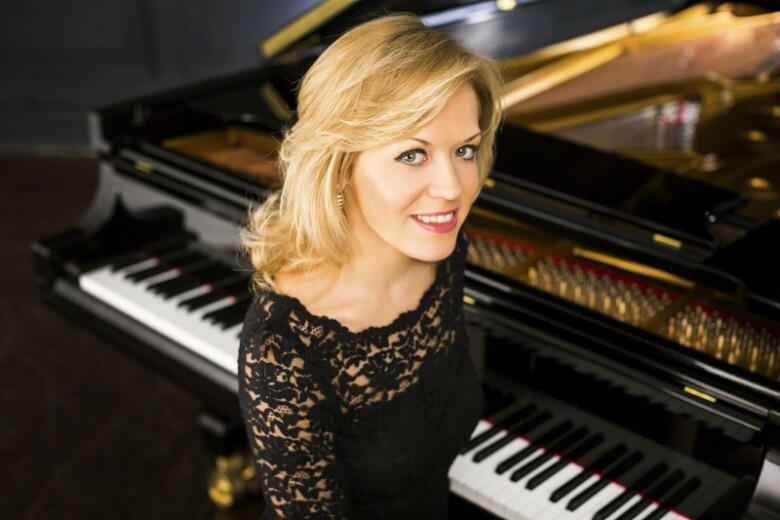 Dalí Quartet with pianist Olga Kern, Carlsen Center Presents at Johnson County Community College. Reviewed Friday, April 12, 2019. It’s a pause. It’s a silence. It’s important. The pause between movements is as eloquent as the the movements. It is a silence that takes the performers and the audience from a “place” they were before the pause to a different place after the pause. If you’re in the audience please don’t trample all over this pause. Wait for the piece to be done then clap your hands off, stop your feet, hoot, holler, yell and scream your delight and appreciation. If you’re unfamiliar with the music, you’ll know when the piece is done because the performers will relax, turn the audience, and stand to accept your applause. The repeated, insistent, untimely applause was awkward and distracting throughout last night’s performance – to the musicians as well as other people in the audience who were familiar with the music and yearned to savor these silences. It was especially awkward at the end of the sublime Andante during the Brahms Piano Quintet. And the performers DID politely gesture to the audience to stop, especially during the first half. But these gentle hints were ignored. By the middle of the Brahms the musicians had resigned themselves to the constant interruptions. Johnson County, do we need to educate the audience during the pre-show talk, along with the reminders about cell phones, flash photography, and emergency exits, over an amplified speaker before each performance? Do we need an applause/silence light at classical performances like at live TV studios? Because to suggest that an audience that whispers at every pause in a single piece of music, “is this the end of the song?” “are we supposed to [clap]?””which song was this?” somehow represents a cultural avant-garde, may be a friendly and comforting gesture to many of your readers, but it is nevertheless rather ludicrous. Thank you, JCCC music lover! I agree that it was awkward, but within the last five years or so it is increasingly becoming more typical. It’s something musicians will have to navigate and plan for, before getting on stage. The idea of saying something during the announcements is one approach and a good one, I think, in that it doesn’t assume anything of the audience, and would probably set both musicians and audience members at ease. I’ve seen this play out many times, this tension between audience members who clap, those who don’t, and the musicians on stage. This was such a clear example of what has already been happening I wanted to highlight it and I appreciate you offering your experience and opinion. I also keep in mind that this practice of silence between movements, and even during performances, is relatively new and somewhat particular to classical music. We can’t expect our audiences to discern which mode of etiquette is appropriate to which style of music, trying to match 18th century norms with 18th century music, 19th with 19th, and so on. We are a 21st century audience listening, in many cases, to 18th and 19th and early 20th century music, each coming from a different culture and community and practice. Many other music styles have audience sound during performances, especially if you consider the practice of applauding after solos (in ballet) and arias (in opera), without even considering rock, jazz, folk, etc. I’m not sure we need to revert to having claqueurs, but Kansas City and Johnson County have very appreciative audiences, with nearly every performance receiving a standing ovation that I’ve attended in the last 10 years. To ask these audiences to tone down their appreciation, or to scold them for it, would not have a positive impact and would, I feel, make them uncomfortable, dull their curiosity and enjoyment, and possibly make them unwilling to attend further events. I was at the concert and I was surprised by the clapping between movements as I don’t experience that in my city or other large cities. But there’s something else to know. Having had a performance career, this does not bother the musicians nearly as much as you might think. These musicians are thrilled by the enthusiasm of an audience, that they are connecting to the audience, and the audience wants to show their joy in return. Clapping never bothered me nor did it effect my concentration. We brought guest with us and they mentioned later that they didn’t know about the unspoken clapping tradition. And I said nothing.